MSJ student Matthew Kohlmorgen has been doing Charity Miles to raise donations for Feeding America, the largest domestic hunger relief organization. Here is a sample of some of the workouts he has tweeted. Matthew Kohlmorgen of the College of Mount St. Joseph (MSJ) is using both his writing talent and athletic ability. 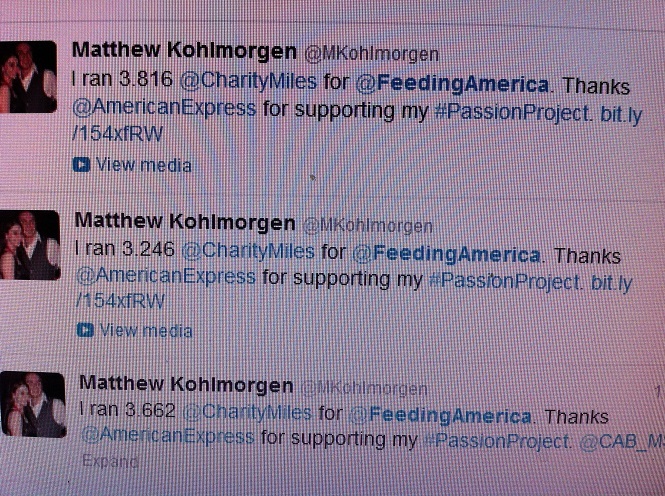 As a member of the MSJ Charity Miles team he runs to help Feeding America. Charity Miles is a free app you download onto your smartphone. For every mile you run, walk or bike a donation is made to a charity of your choice, paid for by a corporate sponsorship pool. Through December 17 Lifeway Foods is matching all Charity Miles with a donation to the UN World Food Programme, the leading hunger relief agency in the typhoon-devastated Philippines. Kohlmorgen is one of the top Charity Milers at MSJ. He is a senior English major and a published writer. In this interview Kohlmorgen discusses Charity Miles and a special project he is working on about Ernest Hemingway. Q. Which type of workout do you use for Charity Miles? A. When I use the concrete as my gym I love to just run and forget about everything. Running is a great way to relieve stress and the best part about using Charity Miles is that something so simple as running can make such a difference to people. Lately I have been doing a lot of yoga on account of not having much time to run. Q. What are some of the charities that you are helping? A. My favorite is “FEEDING AMERICA” because I have a soft spot for the domestic American family who is suffering, this is something that allows me to feel that I helped put food on a hungry family’s table, just because I go for a run. Q. Do you have a personal connection with any of the Charity Miles causes? A. I have been very fortunate and blessed in my life. I don’t know what it is like to go to bed hungry or what the feeling of having to swallow pride and go to a community centre for food feels like. I want to do everything I can to make sure that I give what I have in my life back, I can’t be selfish and forget about those who don’t have all the benefits that I have. If anyone is even remotely charity minded then there is no excuse to not have Charity Miles on your smart phone (an appliance that almost everyone has). Q. As an English major you are working on a special project involving Ernest Hemingway? Can you tell us about that? A. Yes! The project has had so much developmental hurdles because there is always that pressure to say something new, but how do you say something new about a man who has been so intimately studied by just about every single respectable institution? If we are talking about a Hemingway book that analyzes him as a writer, human being, or journalist then there is absolutely nothing new to say. However, in fiction there is so much to approach because that gives an audience of fans and non-fans a chance to see him from a different lens and having him opposite one of his contemporaries who has just as much intellectual and creative gravity would be fascinating-that is why I chose Orson Welles vs all the others in his generation. To see Hemingway argue with someone who wasn’t weaker than him, who could drink as much as him, and who could possibly outwit him is something I would like to see myself. Luckily, no one has made such a play so as a fan that is why I am pursuing this. Finally, I have always thought that Hemingway deserved a medium that approached him with a new perspective, that perspective being something that shows everything he was. The suicidal and mentally ill individual, the warm and caring father, the drunken misogynist, the close friend and argumentative writer. There are whole books dedicated to every topic I just mentioned, but nothing that has tackled the entirety of his complex personality. Fiction allows me to do that, and I needed someone who would be able to contend with him in all those areas, to me that was Orson Welles. Q. Did Hemingway happen to spend time in the Philippines? A. little bit of time yes, as far as I can determine he really didn’t do much profound thinking there. I hate to admit it but I had to really research (aka Google) that one. He was there in 1941, right after his marriage to famed war correspondent Martha Gellhorn. He spent time in the famous Manila hotel drinking, bull fighting, and boxing, pretty conventional behavior for the Hem. Q. Can someone follow your Charity Miles workouts? A. Of course! My Twitter account is Twitter.com/MKohlmorgen. Bill, it as always has been a pleasure and congrats on being a blogger for the HuffPost!